Musica for Africa is an exciting new project that brings together people of different backgrounds, yet who share the same values of peace, love and freedom of religion, and express them through music. Drawing influences from Italy, the United States and Africa, it is a unique blend of genres ordinarily worlds apart. “Where Will it End” tells the story of the tragedy. It features Mermans Mosengo, of the international group Playing for Change, Thuthukani Cele, former keyboard player for Lucky Dube, and Johannesburg’s own Wits University Choir. 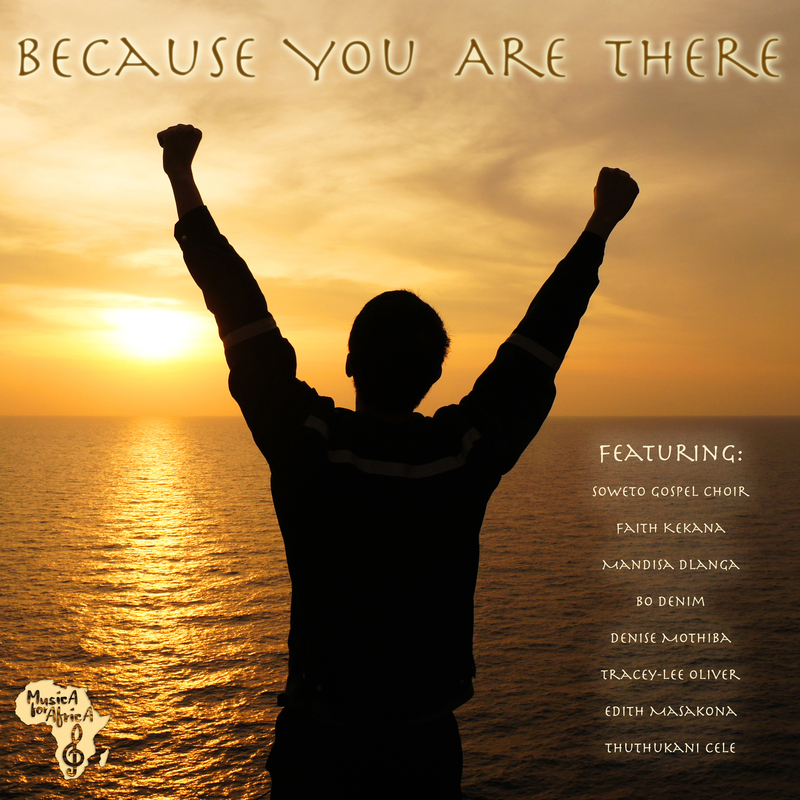 “Because You Are There” is a powerful spiritual sung by an ensemble of talented South African singers and the world-renowned Soweto Gospel Choir. As a bonus, we have a second version of “Where Will it End”, sung by acclaimed New York City soul Artist, Clayton Bryant, and featuring the Soweto Choir. “Because You Are There” is an ensemble piece with a total of six South African singers and the Soweto Gospel Choir. A classic spiritual, it has a repeating refrain, and a steady crescendo of various musical elements. Beginning with a simple lead vocal, it grows to include influences of Dixieland jazz and a triumphant chorus. The lyrics tell a poignant story of different people suffering the hardships of poverty, yet who manage to hold on to their smiles, hope and joy for life because of the everlasting presence of God. Despite being destitute, they remain rich in their hearts. The first lead is Faith Kekana, a rare contralto and past collaborator of Miriam Makeba and Hugh Masekela. Then we have Mandisa Dlanga, who of late collaborates with Johnny Clegg. Bo Denim, lead singer of the well-known group, Denim. Denise Mothiba, a young and talented up and coming singer. Tracey-lee Oliver, a powerful singer, who has appeared on South Africa’s “Voice” television program. Edith Mudau Masakona, who has traveled the world singing in the musical, The Lion King. Together with the epic chorus of Soweto, they provide a moving chant that we dedicate to the countless souls of today and times past who struggled with poverty yet persevered. “Where Will it End” is a hymn dedicated to the victims and their families of the Garissa University College attack of April 2, 2015, in which 148 people were killed and 79 were injured. We believe that we must all feel united with them, and to remember those who were so young and full of aspirations, killed not indiscriminately, but merely for their religion. We made two version of Where Will it End. This one was sung by two African reggae artists: South African native, Thuthukani Cele, former keyboard player for Lucky Dube, and Congolese artist, Mermans Mosengo, member of the international group Playing for Change. Together they provided lead vocals over English and Zulu harmonies sung by the The Wits Choir of Johannesburg, which specializes in Ethnic African music.